KOHLER<sup></sup> Experience whirlpools and baths indulge your body and energize your mind. With its generous bathing well, this Bancroft Experience 5.5 ft. bath delivers complete comfort and satisfaction. Its traditional aesthetic, inspired by early 1900s American design, complements the nostalgic elegance of the Bancroft Suite. Also available in store by special order only see store for details. Experience BubbleMassage baths feature individual massage zones for a targeted or combined massage of the feet, midsection and neck. With 120 precisely positioned air jets, this Bancroft Experience 5.5 Ft. BubbleMassage bath with heater accommodates the individual interests of each bather and maintains a constant, comfortable water temperature. Its traditional aesthetic, inspired by early 1900s American design, complements the nostalgic elegance of the Bancroft Suite. Also available in store by special order only see store for details. Settle into a relaxing soak in classic style. Part of the Bancroft collection, this bath draws its design inspiration from the simple elegance of early 1900s American architecture. An integrated tile flange helps protect against water damage. Sunstruck 5.5 ft. Center Drain Bathtub With Fluted Shroud In White Surround yourself with tranquility and comfort in the Sunstruck freestanding bath. Combining luxury with practicality, the oval, ergonomic design conforms to and supports your body as you stretch out and enjoy a deep, relaxing soak. With its gracefully shaped lines and fluted shroud, this versatile bath complements a wide range of bathroom styles and offers easy three-step installation. 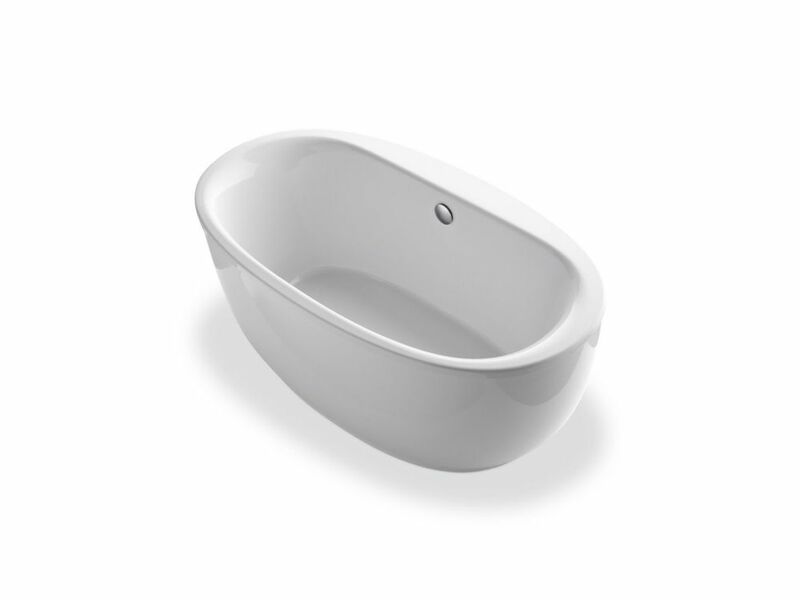 Sunstruck 5.5 ft. Center Drain Bathtub With Fluted Shroud In White is rated 5.0 out of 5 by 2. Rated 5 out of 5 by Mary from I love the soaking tub! The length is great...allows stretching out! Kohler makes a super product. I love the soaking tub! The length is great...allows stretching out! Kohler makes a super product. Rated 5 out of 5 by Lmac369 from Love it! This tub is beautiful!!! Soaking in it is a dream!! !